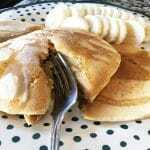 Enjoy whole wheat pancakes that are buttery and fluffy. We use freshly milled whole wheat for this recipe. 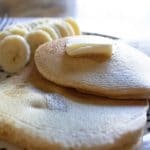 This is the best whole grain pancake recipe and comes from my whole grain cookbook, Baby’s First Foods by Theresa Powers. Whisk together all the dry ingredients in a large bowl. Heat together the milk and butter. 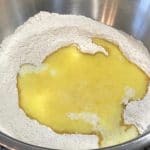 Lightly beat eggs and extract together. Make a well in the center of the dry ingredients, add the milk mixture and the eggs. 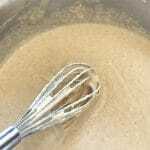 Whisk until blended. Start adding more milk, one cup at a time (I used 5 more cups.) Whole wheat flour will soak up liquid so I recommend letting the batter sit for 10 minutes to make sure it remains at a consistency you desire. If you need to add more milk, I would whisk in 1/2 c. at a time. 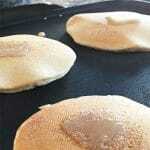 The batter gets wonderfully smooth if you let it rest. 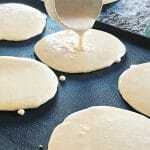 Test a pancake! Flip and get some real butter – see our recipe for spreadable butter! Add maple syrup, fruit and enjoy!